Singapore's businesses remain pessimistic about the next six months, but to a lesser degree than they had been a quarter ago. Results of the latest Business Times-UniSIM Business Climate Survey suggest - as economists believe - that Singapore's GDP growth for 2013 could come in at the top end of the official 1-3 per cent forecast range. In fact, economy watchers widely expect Prime Minister Lee Hsien Loong to revise the government's forecast to 2-3 per cent, the upper half of the current forecast, in his National Day Message this evening. Companies which expect business conditions to deteriorate over the next six months still outnumber those that see brighter days ahead, but by a slimmer margin, the quarterly survey shows. Of the 169 firms polled from late June till July, 41 per cent said their business prospects for the next six months looked worse than a year ago, down from 43 per cent in Q1's survey. Some 25 per cent expect business to pick up, while the remaining 34 per cent think prospects remain unchanged. As a result, the weighted business prospects net balance - the difference between the proportion of upbeat and gloomy firms adjusted for their sizes - improved for a third consecutive quarter to negative 13 per cent. Despite the improvement, the dominant mood from the Business Climate Survey was gloom, unlike recent government surveys which found a net expectation of more favourable business prospects among the larger number of firms polled. Manufacturing companies reported a positive net balance of 8 per cent, while the services firms had a positive net balance of 9 per cent on the Economic Development Board and Department of Statistics' recent business expectations surveys. These views come after the Singapore economy outstripped the most bullish of forecasts to grow 3.7 per cent year-on-year in Q2. However, economists say that this advance estimate, based largely on the April and May data, will probably be revised downwards by the Ministry of Trade and Industry next Monday, due to the disappointing exports and manufacturing performance in June. For respondents to the Business Climate Survey, the second quarter was one in which overall business activity contracted further. More companies reported falling sales, profits and orders or new business than those reporting growth. But signs of improvement were observed. "The contraction in profits and orders or new business was less widespread, while that in sales remained unchanged for the fourth consecutive quarter," said survey director Chow Kit Boey. Also, business conditions in Singapore improved in Q2, although conditions abroad remained as weak as they were a quarter ago, Ms Chow added. Close to three-fifths of the respondents said that they had business overseas. In particular, the contraction in sales for the Singapore market was milder than that for foreign markets, though sales declines also became less widespread than they were a quarter ago. The four indicators tracked by the survey - sales, profits, orders and business prospects - have proven to be correlated with economic growth over the survey's 18-year history. The business prospects indicator, lagged a quarter, has shown the closest correlation to quarterly GDP growth rates. This round, it predicts growth of between 3.6 and 4.1 per cent in Q3. 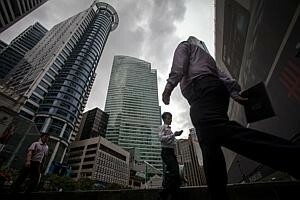 "If this materialises, then Singapore would have expanded by 2.5-2.7 per cent in the first three quarters of the year. Should the momentum of growth continue in the fourth quarter, the upper end of the official forecast of 1-3 per cent would be attained," said Ms Chow. Economists widely expect the government to narrow the full-year GDP growth forecast to the upper 2-3 per cent half of the current projected range, an announcement which may be made this evening by the Prime Minister. "Downside risk to growth in the coming six months remains modest, but the pace of expansion will also be subdued. On balance, growth will likely come in in the 2-3 per cent range, although officials still have the leeway to adjust it upwards in November, should the need arise," says DBS economist Irvin Seah. Bank of America Merrill Lynch economist Chua Hak Bin thinks an upgrade is likely too. "Growth is recovering at a decent pace, led largely by the services sector. Manufacturing and exports appear to be stabilising and may show a weak recovery in late 2013," he said. The survey found that companies in the transport and communications sector had the best business prospects for the next six months. It was also the top performer in sales, while manufacturers reported the most widespread profit growth and construction firms topped in securing new business. OCBC economist Selena Ling expects that apart from sharing Singapore's growth figures, the Prime Minister is likely to reiterate the need to "press on with economic restructuring, but also rebalance society for more focus on the lower income - whether for housing, education or skills upgrading - and to cope with an ageing population".